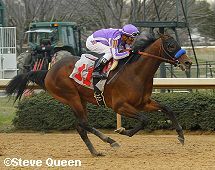 Note: Winless in 5 starts as a juvenile in California, he broke his maiden at Santa Anita on January 21 then shipped east to win the Southwest (G3) first division at Oaklawn on February 20. He went next in the Sunland Derby (G3) where he ran a disappointing 7th, then the Lexington at Keeneland where he was 9th for his final prep. Not going to the Derby now.